The fly rod is a “tool” for the fly fisher pursuing all types of fish. Considerations for choosing a fly rod was compiled in 1996 while teaching fly fishing at WCU. Many have heard instructors say “let the rod do the work” and I can assure you that it is you the fly caster doing the work! That saying has always made me cringe as a fly casting instructor! Most fly casters would benefit from quit “working so hard forcing rod turnover”. Rod actions have been described for a number of years among the fly fishing community with terms such as power, soft, delicate, responsiveness, and many others. These terms may cause confusion to the consumer when used to market rods. The purpose of the Western Carolina University studies in 1996 was to provide information to aid the consumer when choosing a rod, provide feedback to rod designers, and the AFFTA (American Fly Fishing Tackle Association formerly NAFTA). Many sub-pages were created to highlight the significant topics that were studied such as the rod balance and rod dampening articles. The key to choosing your next rod is to become familiar enough with the terms introduced and how they apply to your casting. Learning how to properly use your equipment in fly casting is more important than the equipment itself. Why are golfers constantly taking lessons with a pro to perfect their swing? Fly fishers tend to jump into the sport and remain self-taught. It is up to you to change your style every time you attempt to cast a different rod to compensate for the differences in rod action. The data contained herein is not a substitute for actually casting rods which you are considering. It may assist you in choosing rods that are worthy of trying out, as well as within your price range. The above quote is perfect for the poet fly flingers globally! Another definition can be found in the article of fly casting terms. Fly rod materials have included wooden sticks, greenheart wood, bamboo, steel, fiberglass, and graphite for well over 600 years. The rod weight you choose has a purpose for matching them to the AFTMA fly line recommendations. If you thought fly rods were confusing than just have a look at fly lines! Fly line weights are all over the place as I write this update in January 2018! A fly rod used for lifting powerful saltwater fish will have very different needs and attributes than a light trout rod. The powerful saltwater rods are more focused on lifting power than fly casting comfort. 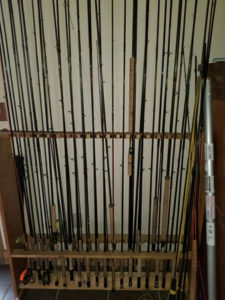 A good all around rod for beginners would be a #6 or #7 weight rod. The beginner fly caster will be able to feel the line load during the cast with a heavier line. The rod is more versatile for fishing a wide variety of waters. Long #2 and #3 weight fly rods are superior for protecting very light tippet. They also enable the angler to fish up to 30 feet away with only the tippet in the water! There are many advantages to the tight lining method (Euro Nymphing) for certain water types when fly fishing. I helped design the long rods in the late 1980’s. The delay for them to become commonplace was almost 20 years later! My area of Western North Carolina is still the largest demand for attaining these specialty rods because of the competition scene in Bryson City, NC. The price of fly rods has varied significantly from when I conducted the rod studies at Western Carolina University in 1996. A high-end rod in the early to mid-nineties ran about $300-$550. Now for that similar value, you can own a rod manufactured in South Korea that does not quickly dampen and an uncomfortable swing weight. The old saying “buy what you can afford” is still good advice! Do not expect dampening, swing weight factors, overall comfort, and many other attributes to be similar to the high-end rod manufacturers. If you fish a few times a year go for the inexpensive foreign rods that will be less expensive. The high-end rods today vary from $800-$1200 for single hand fly rods. 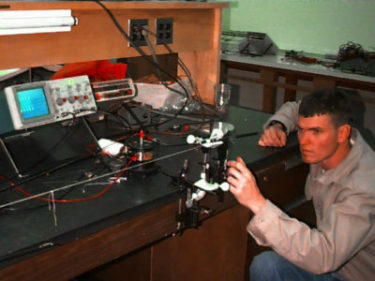 The study is conducted in a controlled lab environment and compared to a blind study of twenty accomplished fly casters. The average years of experience for the casters was 23.5 for a total of 470 years experience. The panel felt that medium action rods offered the average caster the greatest control over the fly line for most angling scenarios for trout. For example, medium actions are easier for casting curves in either direction and the caster can feel the tip when performing casts. The casting group is skilled at controlling the cast. The rods include 54 five-weight rods with a length of nine feet. The casters survey did show a correlation of .99 when compared to the controlled lab results overall. The main comments of the casters for the majority of the rods tested included: too much glare (with the exception of Loomis rods) and the majority of the reel seats accommodate a very small reel foot. This forces the consumer to either buy a high-end reel or file your old reel foot down. Check out the rod balance article as well as the rod dampening article. The data taken in the lab does assist the caster in predicting many of the rods attributes. There is no substitute for actually casting the rods before making the actual decision as to purchase. The data will aid you in forming your own hypothesis as to different rod attributes. The panel gave high ratings for well-balanced rods that were light in overall weight and dampened quick. Understanding how different rod actions influence your specific goals will require you to experiment with many rod actions. Medium action rods offer the greatest control for the widest circumstances for trout angling. Since there is not a present standard for rating rods, is there a difference in a fast action five-weight versus a slow action eight-weight? Can you buy a rod on “action” to explain terms such as stiffness, dampening, frequency, weight, and others? How do weight and balance influence the vague singular term of action? Having a few simple tests which quantify certain attributes would provide greater information for the consumer. Thanks to the rod manufacturers for enabling this study take place and to Western Carolina University. All rod manufacturers in the US were given an equal opportunity to participate in the study.